A & B- 15 HERBAL OILS PERFORMANCE BLEND---8 oz. Our Products >> 15 PREMIUM OILS PERFORMANCE BLEND---16 oz. the racing performance of your pigeons. This product was designed to be used for all your pigeons demand and needs. Premium-15 Performance Oils is a proprietary blend of nutritional oils to enhance the overall qualty of life and performance of the Pigeons. It is recommended that you use this product when administering any of our supplements , for OPTIMAL results. This Product can be used throughout the year!! Contains: Wheat germ oil, Flaxseed Oil, Hemp oil,Garlic oil, Olive oil,Canola Oil, Sesame Seed, Cod Liver Oil, Sun flower seed, Safflower seed oil, Grape seed Oil, Vitamin E oil, Vitamin D Oil, Lecithin Oil. Mix 1 tablespoonful of OIL with 1-lb. feed. 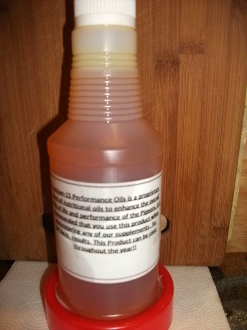 15 PREMIUM OILS PERFORMANCE BLEND---16 oz.